Two men who were part of a huge network of internet software pirates, known as Drink Or Die, have been convicted of conspiracy to defraud. Alex Bell, 32, of Grays, Essex, and Steven Dowd, 42, of Newton-le-Willows, Merseyside, were among 60 members of the Drink Or Die network arrested. They denied downloading software for profit after being arrested in a US-led operation and will be sentenced in May. DOD members did not make any profit but police denied they were "Robin Hoods". They were among eight Britons arrested by the National Hi-Tech Crime Unit in December 2001. Det Con Kevin Brownless, one of those who led the inquiry in Britain, said it was wrong to think of DOD as "Robin Hoods", stealing software from big corporations and distributing it free on the internet. Bell and Dowd claimed throughout their Old Bailey trial they had not done anything illegal. They said they were simply downloading software so they could try it out before deciding whether to buy it. But Det Con Brownless said a conviction would send out a message to computer software pirates in Britain: "Software which ends up on the shelves of shops like PC World represents years of work to produce that product. "Huge amounts of money are spent on research and development and the only way that can be reimbursed is by people paying for software in the appropriate way and not downloading it for nothing. "People have got to realise that the people who create computer software are entitled to the protection of the law and those who break the law will be dealt with by the courts." US Customs officials estimate DOD was responsible for pirating billions of dollars worth of computer software, games, music and videos. The Bell and Dowd trial brought to an end a long list of prosecutions both in Britain and the US. But one man still in legal limbo is British-born Australian Hew Raymond Griffiths, who is still fighting against extradition from Australia to the US. An NHTCU spokesman said there were four levels of operatives in the DOD network - suppliers, crackers, testers and packagers. 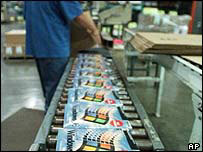 Suppliers, such as Dowd, would obtain the software. They would then pass it on to expert crackers such as Denis Osdashko, a Ukrainian mature student living in London, who would be given the task of reverse engineering the software. Once cracked, the testers - often IT managers with access to sophisticated computer systems - then made sure the reconfigured software worked before passing it on to the packagers. It was their job to upload the software onto secure servers from where it could be delivered to users on the internet. The packagers would also add special labels to the software which acted like film credits, ensuring fame and notoriety for those who had cracked it. The trial heard that Bell, who worked in the IT department of Morgan Stanley bank, supplied the details of several credit cards - unbeknown to the card holders - which were passed on to other members of DOD for use in acquiring software. In one case a stolen card was used to supply software worth $4,000 (£2,200). 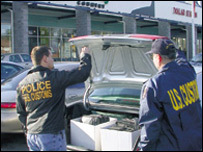 To bring down the whole network US Customs were able to find informants who were prepared to give up the whole operation. These included Kent Kartadinata and James Cudney, who both gave evidence by videolink at the trial of Bell and Dowd. IT manager Ian Dimmock, 35, from Sittingbourne, Kent, pleaded guilty to Copyright Act violations and was fined. Andrew Eardley, 36, an IT manager at a school in Staffordshire, and Mark Vent, 30, who worked in the IT department of London PR giants McKinsey's, pleaded guilty to conspiracy to defraud and are due to be sentenced soon. Denis Osdashko, 26, a Ukrainian mature student, from Streatham, has pleaded guilty to Copyright Act violations and been fined.